This book is truly my favorite to have come out in a long time (if ever)! Every one of the ten patterns included is a stunner! There is not one thing in this collection I wouldn't knit up if I had the chance. So much knitting and so little time! - Tactile Fiber Arts, Temecula Sock, the special colorway dyed with eucalyptus leaves, & Rustling Leaves Beret. - String Theory, Caper Aran, colorway Skerry, & Water's Edge Cardigan. - The String Theory yarn I'm thinking of using for a Gnarled Oak Cardi of my own. - Special Season Finale episode of NNK that brought tears to my eyes. I was also priviliged to have knit two items for some of the Coastal Knits trunk shows: the Rustling Leaves Beret & the Sand and Sea Shawlette. Unfortunately, I don't have any pics to share, but they both turned out beautiful and were a true pleasure to knit up. If you own the book already, check out the last page. It's got my name on it under "fabulous test knitters"!! Sorry, had to brag a little there. I'm still looking for just the right yarn and colors though! I'll know it when I see it, I'm sure. The Coastal Knits duo has put up for grabs two of their lovely, shiny, new books for you to have a chance at winning and what's a YOTH giveaway without the yarn, right?! So, I wrangled up a few of the yarn brands used in this book to send over a couple skeins to give away as well for a sampler set of sorts! (From the bottom up) String Theory's lucious Caper Aran in the colorway Tavikki, The Fibre Company's romantic and oh-so-very-soft Organik, and Quince & Co.'s interesting and wonderful sparrow yarn. Two followers have the chance at winning a printed copy of Coastal Knits and a skein each from the sampling above. That way you can meet the yarn in person and swatch for a project or two or three if you feel like it! 2. Leave a comment on this blog post by the end of Sunday, 12/18/11. Have you seen Coastal Knits? Do you possibly own the book already? If so, what have you knit or are wanting to knit from the collection? I have a copy of Coastal Knits, and it is wonderful. I have several patterns I want to knit out of it. I'd love a copy to give to my aunt, and that yarn is beautiful! 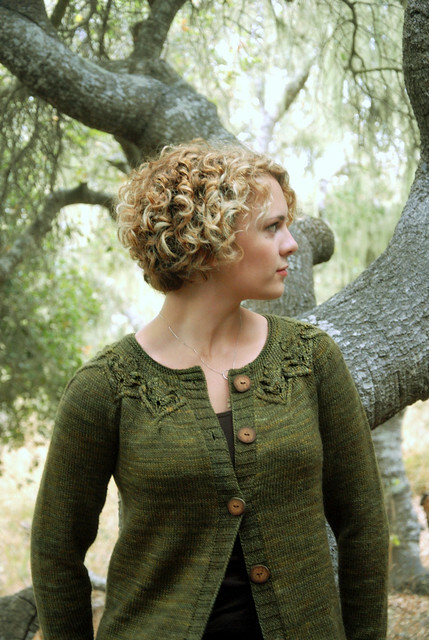 I haven't seen the book in person (yet), but I adore the Gnarled Oak Cardigan. I have not had a chance to look at the book myself, but I have heard that it is very beautiful- both in terms of patterns and visually as well. I pretty much love every cardigan in it, with my faves being Rocky Coast and Wildflower! Wonderful giveaway, thanks to everyone! i can't wait to make the gnarled oak cardigan -- haven't seen the book in person [yet] but will have to get a copy one way or another! I keep seeing the Gnarled Oak Cardigan in blog posts etc. It looks fab! I hadn't seen it until now, but I might have to buy a copy if I don't win one; those are some lovely patterns! I don't own it (yet), but I want it! I think, like everyone else, I want to knit Rocky Coast. I don't have a copy, but I've seen a lot of really positive reviews of it. I keep meaning to take a look at it at my lys, but haven't yet. I haven't seen it yet in person, but I love love love the Bayside Pullover & the Water's Edge Cardigan. Not sure which I wan to tackle first. I've bumped into the book once or twice on the internet, though not in person. :) I would love to knit the Wildflowers Cardigan! OMG, I've been lusting after that book ever since I first found out about it! I've got to have a Waters Edge Cardigan, and a Rocky Coast Cardigan! Thank you for such an awesome giveaway, and thank you Hannah and Alana for putting together such a beautiful collection! I really loved the Roasty Coast cardigan. Such, simple & classic styling yet effortlessly updated! Beautiful knits all throughout the book--but the gorgeous garments are my fave! I'd not seen this one, but having looked at it now, I have to say I love the patterns! I don't have the book yet but would love to knit the Rocky Coast Cardigan! I preordered Coastal Knits and I am almost finished with the Rocky Coast Cardigan. I want to knit several more items from the book! Thanks for the chance to win. I just went to a Coastal Knits trunk show last Friday! And I was there to get the book for a friend's holiday gift, but I did like the samples quite a lot. Maybe someone will get me the book for Christmas?!?!?! I haven't seen the book in person - and I'm going to be looking for it...the patterns are gorgeous. Each time I've seen that book on its blog tour, the white cover cardi makes me weak in the knees! I haven't seen the book in person though. I'll bet it's stunning! I don't have a copy yet and would really really love one. Gnarled Oak and Wildflower have got to me tops of my list, though all the patterns are lovely. There are so many beautiful patterns in this collection, that I would have a hard time deciding which to do first! The book is on my Christmas wish list, but winning it and some yarn might be even better! Thanks, all! I don't have a copy. I want this book. I love the designs and the names they are given. I think the design I'm looking forward to the most is Rocky Coast. It's a very classy looking cardi. The book is gorgeous, but I haven't treated myself. And I've been wanting to play with the Quince Sparrow since it came out. 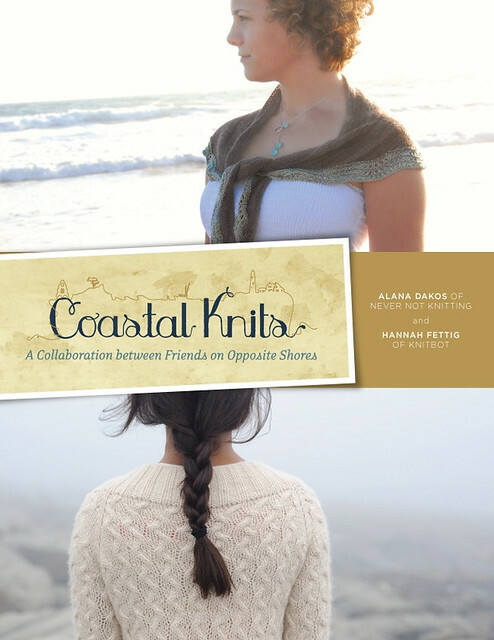 I don't have a copy of Coastal Knits yet, but it is on my list to get! I absolutely love Rocky Coast. I think I'd knit the Wildflower Cardigan first, then maybe the Rustling Leaves Beret. I have seen the patterns in Coastal Knits on Ravelry... they are lovely! I especially loved the Rocky Coast Cardigan and the Bayside Pullover and would love to make them if I win the book! I hadn't seen Coastal Knits before this, but looking at it now I definitely would like to knit every one of these patterns, but especially Gnarled Oak and Rustling Leaves. Thank you very much for this lovely giveaway. I haven't seen Coastal Knits in person, but I've drooled over it online. I would love to knit up the Rocky Coast Cardigan. I don't have a copy of Coastal Knits yet, but I've seen it on Ravelry. I'd love to knit the Gnarled Oak Cardigan. I've seen lots of reviews of this book. I love the Rocky Coast Cardigan. I do, in fact, own a copy of coastal knits. I want to knit ALL OF THE THINGS! I just have to get through the Christmas knitting season and then it's all selfish knitting for the month of January. But first I have to decide what to knit...(therein lies the problem). I have never had the pleasure of working with most of the yarns listed in the book. I would love to have the opportunity! I don't have a copy of the book... yet. It looks fabulous! I love both the Gnarled Oak and Water's Edge cardies. Love both of these designers; I have knitted from both of their collections, but I hadnt heard of this book yet. Now I'm very excited to check it out! I've seen the book, it's gorgeous! I love the beret from Alana, forget the name. this book is top on my wants list! i have peeked at it's contents online and have3-5 items i so want to knit from it. I don't have a copy yet, but I'm dying to get one! 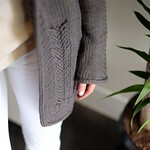 The Rocky Coast Cardigan is just gorgeous :-) Thanks for the giveaway chance! In the midst of a Rocky Coast!! Its been a rocky fall for me and this sweater is just the cozy knit I need to cheer myself up. Love the book!! I've heard good things about the book and everyone I know is doing the Rocky Coast cardigan. I would love to win this! I have the Coastal Knits in my Amazon Wish List, with hopes for Christmas! I'd love to knit the Sand & Sea Shawlette, the Rustling Leaves Beret, and the Rocky Coast Cardigan, first. They're all lovely! Thank you for the chance to win the book and the lovely yarn! I preordered the book and desperately want to make the Gnarled Oak cardigan from it, though there are many others I love as well. I never seen the book before but the knits from your post look beautiful and i can't wait to check it out! This book is something I have had my eye on since I saw the patterns on Ravelry, especially the Rocky Coast Cardigan. What lovely photography too. Congratulations to the designers. Oh wow I have been lusting after this book for a while now. Every pattern in it is so beautiful. If I had this book, I would definately have to knit the bayside pullover though, So beautiful and yet simplistic at the same time. Gosh this would be wonderful to win, I want to make that sweater so bad now!! I have only seen photos, but could definitely see myself knitting most - if not all - patterns in the book. Especially the Wildflower Cardi in bright green or Bayside in a dusty blue. I've seen the book, but I don't have it yet! I love the Rocky Coast Cardigan, but I'd probably knit anything out of that book! I think this book is lovely, with great cardigans - i need more cardigans in my life! I haven't seen the book yet but I would love to win a copy and knit the Gnarled Oak Cardigan, I think it is beautiful. I also love these two designers! The first pattern I would knit from the book is the Gnarled Oak cardigan. I just love it's simplicity and oak leaves at the neck. Gorgeous book! Definitely in my wish list. I've been looking at this book since Alana started talking about it on her blog and pictures started coming up. It's such a beautiful book that I'm dying to get my hands on! I haven't seen the book yet, but Rocky Coast is beautiful and I just might have the perfect yarn for it! These are such elegant designs and very feminine - that is probably what makes them so special. A lovely book for any knitter to treasure. While I have not seen the book in person, I've seen some of the patterns on Ravelry. Beautiful stuff! I haven't seen it in person but I love the Coastal Hoodie! What a fantastic prize! I've seen the patterns on Ravelry as friends have queued and favorited them. I've been dreaming about the Sand and Sea Shawlette since I saw it. 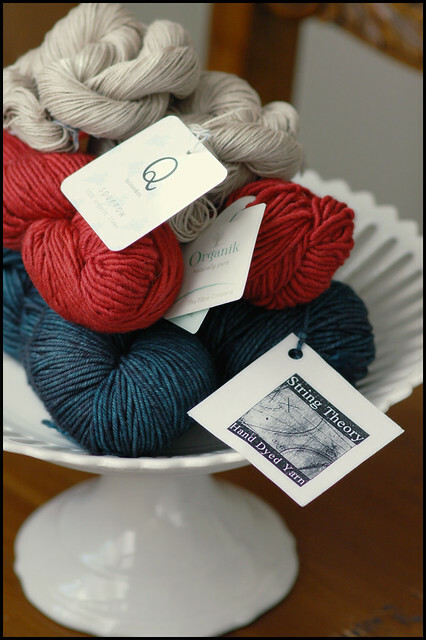 I've got a hankering to knit a two-color shawl and it's just so pretty. I so badly want to knit the Rocky Coast Cardigan - but I want to wait until after I have my baby (due in 2 weeks) so that I can knit a size that would be post partum! I never tire of hearing Alana and Hannah speak. Thanks for the interview. The Gnarled Oak Cardigan is winning my heart these days. I don't have the book , but have been reading a lot about it on the blogs lately. Sounds like a wonderful addition to any knitter's library!! Thanks for the GREAT giveaway! Wow, Ve. You set up another awesome giveaway. I've seen Coastal Knits referenced several places online - seems like they are doing a "blog tour", plus I normally read NKN. I would love to try String Theory! I don't have the book yet, but I have been drooling over it for quite some time. I want to make EVERYTHING! I haven't seen it yet, but I am in love with Water's Edge!! I've seen the patterns in it and I want to make absolutely everything! I did not find a single pattern in the entire book that made go "ehhh, it's alright". They are all so amazing, I had my inhaler out just in case it threw me into a full blown fit!! The only way I would ever be able to decide what to make first is just work from the front of the book to the back - otherwise, the decision process would drive me around the bend. I had not seen the book, but I'm guessing once I see it "in the flesh" I'll have to buy it....and it's all your fault...unless I win a copy! I already have a copy of Coastal Knits and have asked Santa Claus for yarn to knit the Gnarled Oak cardigan. I just love that one! I also have plans to knit the Rustling Leaves beret. It is such a stunning book! I've been drooling over the patterns since they came out, but I've been saving all my pennies for Christmas so I haven't gotten a copy yet. I'd love to make the Rocky Coast cardigan! I haven't seen it in person, but I've been following its progress and drooling over the pattern pictures on Rav. I've got my fingers crossed for Christmas! I have seen Coastal Knits. I *almost* bought a copy, but didn't have any extra $$ at the time. I want to knit ALL THE THINGS.. :-) but I really love the Rocky Coast cardigan. I have a copy of the book and am working on the Rocky Coast cardigan already, but I have a friend who keeps threatening to steal my copy, so I'd like to win one for her. I am LOVING the organik, but I've been curious to feel the Quince for myself. I haven't personally looked at the book, but all the reviews make it sound like a must-have! Rocky Coast Cardigan would most definitely be on my 'to knit' list! I don't have a copy of Coastal Knits, but Christmas is coming! The Rocky Coast Cardigan is beautiful and looks so practical - pretty but not too dainty - just perfect for any number of situations! And the yarns you're offering as part of this giveaway? Yum! Oh, I'd so love a copy of Coastal knits! I have the book, and would love another copy to give -- I have just the perfect recipient in mind! In fact I thought about giving her my copy, it's so perfect for her. I am not saying this to butter you, but my two favorite patterns are the Rustling Leaves beret and I already have some Madelinetosh set aside for Sand and Sea Shawlette! I've been dying to get my hands on this book and that quince and co. looks just delightful. That rocky coast cardigan would have a lovely spot in my cardigan wardrobe. I have not seen the book yet, but the couple of photos you posted look so lovely. I'm going to go check it out on Amazon right now! I would love to win this book. I do not own it yet, but have it on my Christmas wish list, but it would be even better to WIN my own copy with yarn to boot! I agree, I could knit every item in this book... every design is beautiful! I own the book, but would love to try any of the yarns and could find a good home for the book as well if I win. I have knit the Rocky Coast Cardigan and LOVE IT! Thanks for the opportunity to win! I absolutely love Coastal Knits, and want to knit just about every pattern in it! It is a stunning book! As much as I'd like to think I'd knit a sweater, I think it's far more likely that I'd knit the Sand and Sea Shawlette! I want to knit almost everything in this book (especially all of the sweaters), but I've been holding off buying it because I know I don't have time to start on projects for me right now! I have been drooling over this book, and have been anxious to try Quince and Co. yarn. I would love to win a copy of Coastal Knits. The patterns look stunning. I have not seen the book yet. I would love to make the Rustling Leaves Beret. The yarn is beautiful. I have been listening and reading along with both blogs and I love the idea of the book and all the images I've seen from it. I would love to win a copy! Thank you for the interview, and the wonderful giveaway. I follow Alana's blog so I'm familiar with the book but I have yet to see it in person. I would love to knit the gnarled oak cardi. I'm working on her oak fingerless gloves right now. I love that Rocky Coast Cardigan! I would love to own this book. It had so many beautiful designs! I am slowly being convinced that I need to knit the Rocky Coast Cardigan. It is gorgeous! The Rocky Coast Cardigan is beautiful. I'd love the chance to see more of the patterns in the book. Coastal Knits is on my list. There's great patterns, and the yarn choice looks really luscious. 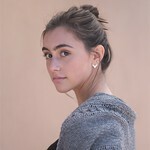 I don't own it yet but you and I must have similar tastes, because I have been eyeing the Rocky Coast Cardigan as well. I love how it looks like the tide rolling in! I have a copy already so I would give a second copy as a gift to a knitting friend. It is the most beautiful knitting book I've seen in forever. Rocky Coast is my top pick but they are all gorgeous! I have been a listener to the Never Not Knitting podcast for a couple of years now. I was THRILLED when Alana announced Coastal Knits and I've been dying to get my hands on it ever since. If I had it, I would probably knit almost everything, but my favorite is the Rocky Coast Cardigan. I haven't seen Costal Knits, but I might have to buy a copy if I don't win one! There are beautiful patterns. I might just try my first cardigan if I win! Bayside, Branching Out and Rustling Leaves are probably what I'd be most likely to make. I'm a male knitter who somehow wound up surrounded by non-cardigan females! But I'm sure I could change a couple of minds with Gnarled Oak. I can be emailed thru my Blogger profile. I haven't got the book yet, but I came so close to getting it and yarn for the Rocky Coast Cardigan--then I chickened out because it must be so gorgeous in the Fibre Company yarn, but you have to get so much. I even knew what color I wanted (that yummy dark blue). I was worried I wouldn't get around to it, and then it'd just be a huge albatross of a stash acquisition. Must. knit. rocky. coast. cardigan! I don't have it yet, but it's on the list for Christmas. Hope someone is paying attention or I'll have to snag it myself. Ooh! What a spectacular book and what lovely yarn. I would love to make a Rocky Coast Cardigan. I have known about Coastal Knits from the Never Not Knitting podcast. I really like all of the patterns and would enjoy knitting from this book if I owned a copy. The Rustling Leaves Beret is beautiful! And so is that yarn! I don't have the book ...yet! But I love the rocky coast cardigan!!! I saw the book in the yarn shop in Macon, GA. The gnarled oak cardigan would be a nice chalenge form me. I've not seen the Coastal Knits book yet, but would love to have a copy. The Gnarled Oak Cardigan looks gorgeous. 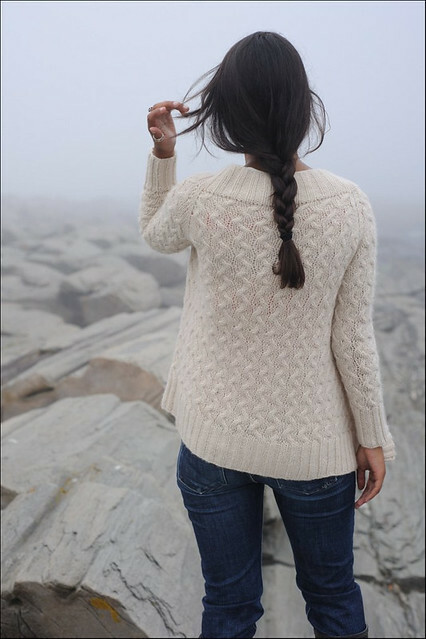 I haven't seen the book in person yet, but Coastal Knits has some gorgeous patterns! I'd love to get a copy! Both the Rocky Coast and Gnarled Oak would be fantastic projects to make. I've not seen the book yet in my local shop but the gnarled oak cardigan takes my fancy. I have been hearing about the book on all the blogs and podcasts I follow, but don't own it yet. I especially like the Rocky Coast cardigan. I do not have a copy of Coastal Knits. It looks wonderful! I am learning about so many fabulous people from you! I have seen a lot written about coastal knits but don't own my own copy yet. I think I would choose "water's edge" to try. I do like Gnarled Oak, but the little ruffles of water's edge appeal too. I saw a friend's copy and I loved it! And the yarn is a dream. I wish I could win this time. I have been admiring many of the cardigans from afar--it would be great to win a copy of this book! I've seen blogs about the Coastal Knits and love the patterns. I'd really like to make the Gnarled Oak Cardigan. I did see a copy of the book recently, and quickly thumbed through it. Mostly, I have seen everything online. Once I get a copy in my hands, will start off by knitting the Rocky Coast cardigan. I haven't seen the book in person just some of the patterns. The Gnarled Oak cardigan looks so pretty. I have not seen the book in person, but the pictures are so pretty. My favorite is the Gnarled Oak Cardigan. The would be the 1st thing I knit from the book. I actually bought the book for a cowl pattern then ended up doing a different cowl designed by Alana. However, now I think I may knit myself a Gnarled Oak Cardigan. I'm sure I could find someone else to whom I could gift another copy of the book! 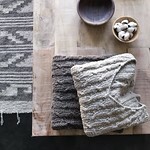 I haven't seen this book yet - but I want to make the Gnarled Oak Cardigan pictured on your blog! If the other patterns are as nice as that one, this book is golden. I want a copy of this so bad and I want to knit a Rocky Coast, I am dying to do so but need to get done with all my Christmas knitting first. I would love a chance to win! I'm dreaming of Rocky Coast. I haven't seen the book in person yet, but I imagine it's beautiful, based on what I've seen on the designers' blogs. I love the projects that I have seen from this book...but I think the wildflower cardigan is my favorite. i don't have a copy but it's on my wishlist! That is some beautiful yarn that I would certainly like to win!!! I don't have this book yet. I do love some of the cardigans and the Rustling Leaves beret. i dont have a copy of the book yet! so of course it would be so much fun to win a copy here! i have been eyeing the bayside pullover for weeks! I don't have a copy yet, but it's on my christmas list! Looks so good! i love coastal knits! the beret and that beautiful rocky coast cardigan are my number ones for sure! I hadn't seen this book and I am so happy to discover it. You are so right--each pattern is a "must have." I been wanting to knit the Rocky Coast cardigan so badly! I've had the chance to flip through the book and it's been on my wish list! I ADORE little knitted things, so the Sand and Sea Shawlette jumped out at me right away! I have not yet seen the book in person, but would love to win a copy! The Gnarled Oak Cardigan is beautiful, and the yarn in the photo is gorgeous !! Haven't seen the book yet. It keeps selling out at my LYS! I'd love to knit the Gnarled Oak cardigan, though. This is the first I've seen of the book - would love to win a copy - although I can't decide which cardigan I would want to knit first - they're all so pretty! And the cowl is very nice, too! I've been eyeing the book but haven't bought it yet. I love the Water's Edge Cardigan! I have not seen it yet but after seeing those lovelies you posted I will have to look into it! I fondled a friend's copy of Coastal Knits at out last knitting circle, I may steal it off her if I don't win it - Gnarled Oak and Rocky Coast just scream my name whenever I see them! I haven't seen the book in person yet but I really really want to. I love every pattern in it. I'm most wanting to knit the Rocky Coast Cardigan and the Gnarled Oak Cardigan first with everything else to follow. Don't have a copy, it's on my Christmas list. I want to make the rocky coast cardigan. I need to learn to knit faster, because I want to knit EVERY. ONE. of the patterns in Coastal Knits! What a fabulous collection. First up, Sand & Sea Shawl for a quick knit, then Wildflower cardi. Beautiful stuff! THanks for the giveaway. I do not have the book but I like many of the designs I checked on Ravelry. Ihave the book and have knit the beret with some yarn I had in stash. I'm trying ti finish gift knitting then I'll be picking something from the book to knit for me again:-) if I win, I would love to gift the book to a friend, and keep the yarn for me ! I don't have the book yet. I'd love to knit up the Rocky Coast and Wildflower cardis. What a fantastic book! Two of my favorite designers. I do not have it yet, but would LOVE to knit up Wildflower and Rocky Coast. I have a copy of Coastal Knits and there are so many great patterns. I would love to make one of the sweaters. I've flipped through the book and have loved so many items within it - especially the cardigan options! Both designers have been favorites of mine for awhile. I need to get the book, because the Rocky Coast Cardigan and Rustling Leaves Beret are calling my name. I must make both. Congrats to Alana and Hannah - and a thank you for doing this lovely giveaway! I absolutely love Hannah's work, and am so looking forward to getting my hands on a copy of this book. The yarn colors are gorgeous! I have seen Coastal Knits in my LYS, but it sold out before I could get a copy. I've seen the patterns on Ravelry, and I love, love, love the Rustling Leaves Beret, the Rocky Coast Cardigan, the Water's Edge Cardigan, and the Gnarled Oak Cardigan. I could honestly knit the whole collections!! Love what I've seen of the patterns so far, haven't seen the actual book yet! Also I love Fibre Company yarn! Oooh, I've been watching this one as the patterns pop up in my friends' activity-Gnarled Oak has gone straight to the queue, and so many other things in this book are equally lovely! I haven't seen the book, but I would love to receive a copy! I have seen the book many times! I would love a copy, I really wan to knit the Rocky Coast Cardigan!! I want to knit just about every pattern in the book! This is a lovely book. The first two I will knit are Cambrian Cowl and Rocky Coast. I think I would make a shawl first but my eyes keep going back to the cardigans... so who knows?? I will have to look for you name at the back of the book. ^_^ What fun?! I have and absolutely adore Coastal Knits. I think it's one of the most visually appealing books to come out in a long time. And I desperately want to make at least half of the patterns!!! I don't own the book, but I have oogled the photos on Ravelry. Gnarled Oak Cardigan is gorgeous, as is Wildflower. But heck, they are all great designs. Thanks for the opportunity to throw my name in the hat! Haven't seen the book in person yet, just teasers on the internet. I'd like to start with the Rocky Coast Cardi & the Rustling Leaves Beret. These yarns are lovely, and I've had my eye on Coastal Knits for a while, ever since I first saw the Rocky Coast Cardi on the front of it. I'm on a big time sweater kick right now so this would just further enable me! Thanks for the great giveaway! I'm PurlVerde on Rav, see you around! Don't have the book, but the items you've shown look gorgeous! I have a copy of the book and it's lovely! My favorite patterns are the Rustling Leaves beret and the Gnarled Oak cardigan. LOVE the book! I've been coveting a copy since it was published. I would make the Rocky Coast cardigan, hands down! I don't have a copy of the book but I have seen some great patterns from it, especially the sunflower cardigan or the panoramic stole. Thanks for the giveaway. I don't have a copy of the book, but all of the sweaters in it look gorgeous. I think Rocky Coast and Water's Edge are my favorites. I have read a lot about this book, but have not been able to get my hands on it! Thanks for a chance. I love the Sand & Sea Shawlette.I have seen the book & love the patterns,they are all wonderful.What a generous giveaway. I've seen the book and I'm DYING to get it! It's on my Christmas list this year so I'm holding off for now. I would LOVE to make the Rocky Coast Cardigan, to start! Would LOVE this!! Feeling the red, white, & blue! This book is fabulous! I've drooled over every review on the web for it. It's on my list for Santa! I think the Rocky Coast Cardigan would be the first thing I would knit out of the new book! I haven't seen Coastal Knits in person yet, but I've enjoyed looking at the pictures online. All of the patterns are beautiful, but I also look forward to reading the notes and stories that go with each one. I love the wildflower cardigan, especially the pockets. I have seen it in person. I think I like the Rocky Coast Cardi and want to knit that! I love this book and thumb through it regularly. I'd love to try some of the yarns in it. I've swatched and will cast on for the Bayside Pullover after Christmas knitting is done. I also really love the Wildflowers Cardigan and Gnarled Oak Cardigan.